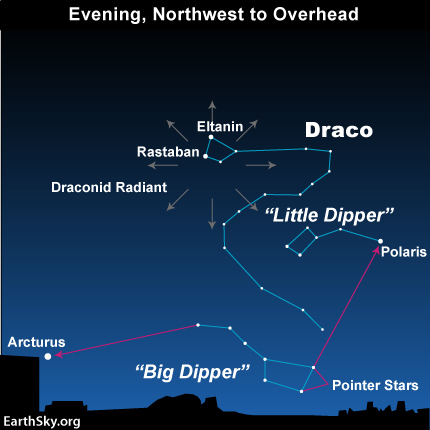 The Draconid meteor shower will again be visible tonight in the northern hemisphere. The meteor shower occurs when dust from Comet Giacobini-Zinner enters Earth’s atmosphere and ionizes, creating a “shooting star” look. The meteors appear to come out of the constellation Draco (the dragon) and the flurry of them will appear highest in the sky shortly after sunset. As night advances the spectacle drops below the horizon. The Draconids can be unpredictable in their intensity. Astronomers have not predicted a noteworthy display from the Draconids this year, but in some years the number of meteors is impressive. In 2011 more than 600 per hour were visible. The reason for 2011’s display was that Comet Giacobini-Zimmer was at the perihelion of its orbit around the sun. Earth’s moon is not likely to be much of an impediment to viewing the meteors, as it is in waxing crescent phase now. Observers will have the best opportunity to see meteors if they choose a viewing location far from city lights.